When pressed about why they included language that suggests Ciara’s loc extensions are not elegant, People backtracked and claimed the colors are what they projected as being too wild for a wedding. This both contradicts the original sentence structure and makes little sense because Ciara is often seen with various shades of brown and blonde hair — as are many white celebrities, about whom People rarely makes conjectures about ditching hairstyles in the name of elegance. Furthermore, the article betrays a complete misunderstanding of Black hair more generally. 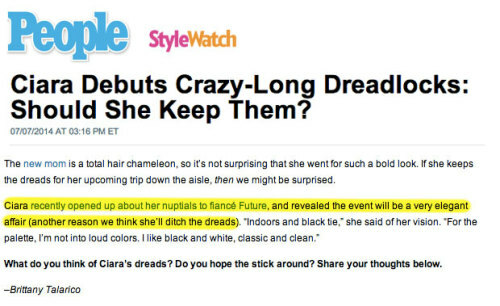 Ciara does not have “crazy long dreadlocks” as the title would have readers believe. To grow “crazy long dreadlocks” would take years. Ciara has loc extensions, and the verbiage matters. Many with locs do not even call their hairstyle “dreads,” a term that evokes memories of Black hair being deemed “dreadful….. continue reading more at Clutch Mag. This entry was posted in Politics of Hair. Bookmark the permalink. The Battle of the Hair Nap….Nappy is Not A Bad Word!